By default, the Red Hat Enterprise Linux 5 GNOME system starts a number of different programs each time a user logs into a desktop session. Sometimes the default list includes programs that are not needed by every user. On other occasions, additional programs are required by the user, or the user may wish for any currently running programs to be automatically restarted next time that user logs in to the desktop. In this chapter we will look at configuring programs to auto-load when a user logs in and how to create and manage sessions. 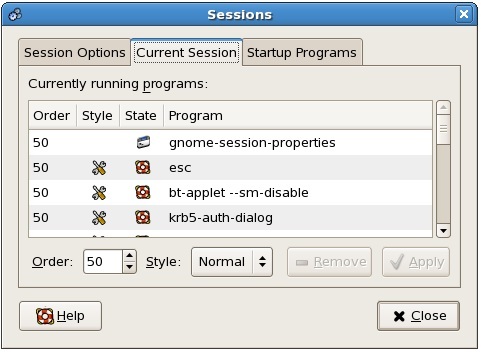 Each time a user logs into the RHEL 5 GNOME desktop they create an instance of a session. This session lasts right up until the point that the user logs out of the desktop or switches to another user. 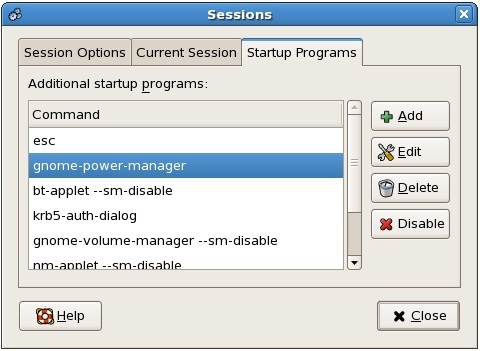 When a session starts, a number of programs are started automatically by the session manager. Many of these are required for the desktop environment to function and are largely invisible to the user. Others may be applications which the user prefers to have started each time she logs in. 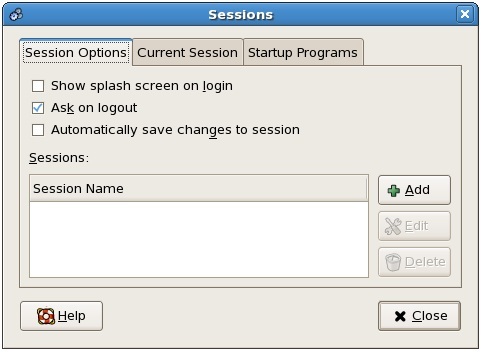 In addition custom sessions can be created, each with a different set of default programs configured to start up, that can then be selected by users when logging into the desktop. Style – Controls what happens to the selected program when the session restarts. Normal indicates the program should start automatically when the session starts. Restart causes the program to be restarted whenever it is exited or terminated. Trash disables autostart for the program. The Settings option causes the application to autostart using the same session settings that were configured during the last session instance.